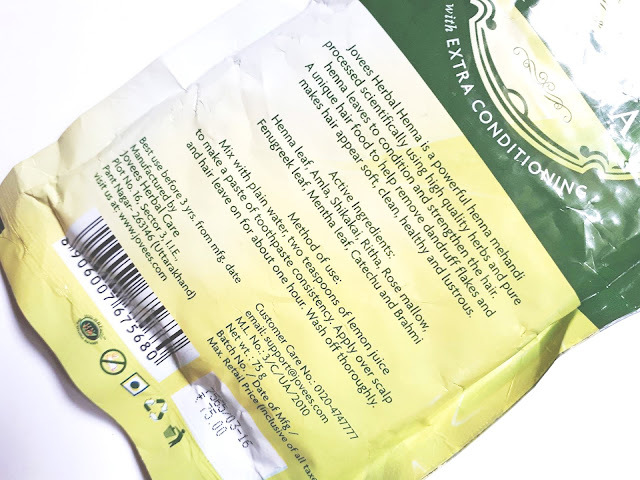 Today I am going to review Jovees Herbal Henna With Extra Conditioning . Jovees Henna is enriched with natural proteins along with precious herbs that will strengthen the hair roots and will give volume, and luster to hair. An excellent recipe for dull and lifeless hair. So, let's get into the more details about this henna. 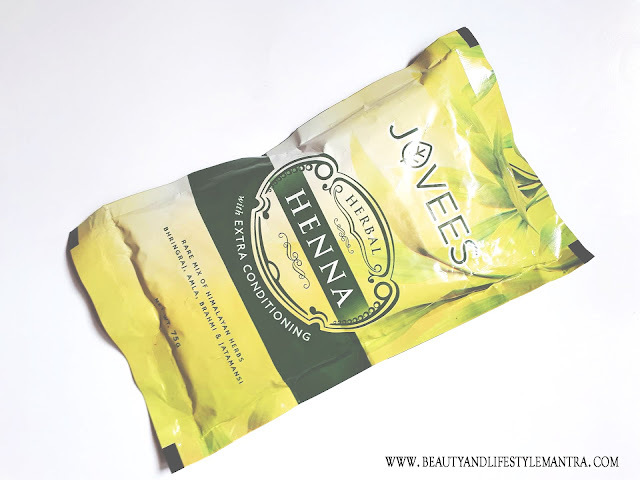 Jovees Herbal Henna With Extra Conditioning comes in a simple plastic pouch. All the necessary information regarding the product are mentioned in the plastic pouch. Once you open the pack, it is a bit difficult to store in the plastic pouch. So it is better to be poured the product into a small container. The powder is fine textured and henna powder is green in color. The smell is not very strong, it’s just like dried henna leaves. I generally use three-way Henna. In my previous post where I reviewed Shahnaz Hussain’s Henna Precious Herb Mix, I mentioned the three processes. Anyway, this time I took the required quantity in a bowl and mixed with tea liquor, one egg, and lemon juice to make a paste. I kept this paste on my hair for around two hours and then I washed my hair with plain water and mild shampoo so that all the henna is washed away. Then on next day, I oil and shampoo my hair. My hair is naturally slightly wavy and I've been using henna regularly for the past 16 years. Dryness and damage are my another biggest struggles. Frankly speaking after the first use this henna makes my hair soft and shiny. After washing my hair (follow up with herbal shampoo and conditioner) it's like I have a whole new head of hair! Jovees henna powder does not dry up my hair. It makes my hair more manageable and smoother than before. Actually, it's pretty good helps to get the color as needed and as it contains amla in it helps in nourishing the hair too. 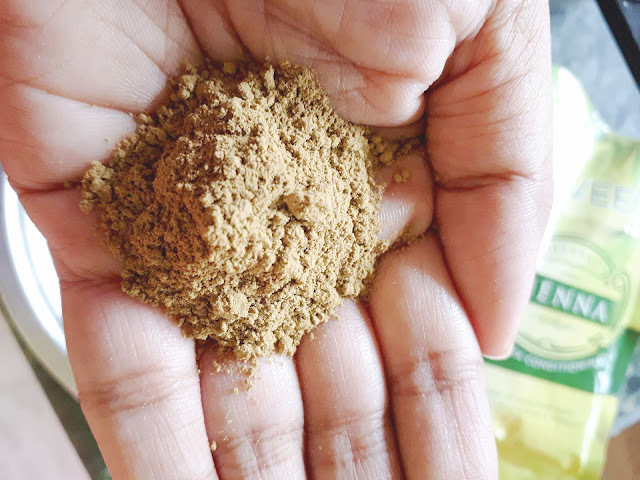 The other ingredients like a rare mix of Himalayan herbs like bhringraj, brahmi, and jatamansi strengthen my hair roots and will promote hair growth. Actually, I did not see any hair fall in two days which I usually do.That it takes a really good product to make such an amazing results. Does not contain any harsh chemicals that lead to itchiness of the scalp, rashes, or other skin infections. Makes my dry and frizzy hair softer and easier-to-manage. Very simple packaging. You need to store the product in a separate container. Although it does not affect the quality of the henna. Overall, it's pretty good from all aspects. My hair was incredibly soft and shiny afterward and all my dry ends don't feel as dry anymore. It leaves my hair super hydrated. On top of that, it is pocket-friendly. Jovees Herbal Henna With Extra Conditioning is suitable for all hair types and will promise to give you that soft and supple hair. So I would recommend this for all hair types.